I’ve loved Billy Higgins’ playing since I first heard him in high school. He plays with such depth and lively soul. I was lucky enough to see him play with Sonny Rollins back in 1993 / 1994 when I was at college in Boston. We couldn’t afford tickets at the time, but a kind usher was nice enough to let us stand quietly in the back of the room. Every so often I go back through Higgins’ discography and look for something I haven’t heard before. 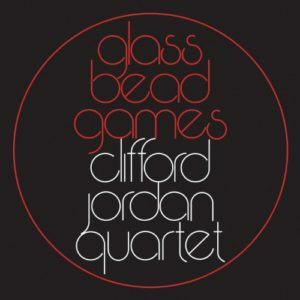 This time it was Clifford Jordan’s Glass Bead Games. It turns out that this was out of print for a long time and came back into circulation with a reissue in 2006. As good as this is, I can’t believe it took me so many years to discover. I can’t recommend this highly enough. Billy Higgins’ timekeeping is wonderful throughout and his soloing as musical as ever. Fortunately, this cd is now easy to find and for reasons I’ll explain below, I strongly suggest purchasing a download and not spending money on the overpriced CD. Buy this as a download and don’t overpay for the CD. One thing I haven’t seen addressed in the many reviews of this reissue are the audio problems, specifically seeming to affect the cymbals dropping out of the right channel intermittently on a few songs, which is distracting, especially with headphones on. You can hear an example of what I’m talking about at around 1:40 in the tune Bridgework, which also happens to be the sample snippet from that song featured on Amazon, iTunes and CD Baby. At first I thought I got a bad download, so I fired up Spotify and YouTube. The same issue was present. I decided to spring $26(!) for the compact disc to finally get a clean copy of the album. I was surprised that it has the same bad audio. It’s a shame that this is the best copy currently available. Despite the audio problems on the reissue, I still recommend it, though I’m hoping for a better reissue of this album some day. I’ve since tracked down a copy of Clifford Jordan – The Complete Strata-East Sessions box set on Mosaic. Disc 6 is the entire Glass Bead Games album and there are no audio issues. The bad news is that this set very hard to find and very expensive.